12 Common House Plants That Filter Your Air – Safe For Cats Too! Sometimes when visiting other people’s homes, I get a thing that I call ‘plant envy.’ There is just something so relaxing about seeing these lush, green trees and flowers sitting by the window or in the garden that makes me want to get in on the plant action. What’s even more enticing is that these common house plants that filter your air are affordable decor. Unfortunately, us pet owners have to be VERY careful when selecting plants for our homes and backyards. One mistake with a peace lily, and we could lose our little best friends to what we initially thought would help them breathe better. I went ahead and did some research and have found some beautiful plants that help clean your air while keeping your fur babies safe. Please take special care to make sure you are getting the correct plants by closely examining the names! This elegant plant with long flowing leaves has been found to do great things for the air in your home while being pet-friendly. It filters out formaldehyde, xylene and toluene from your indoor air and is known to be one of the most effective air cleaners (according to NASA). What I really like about the spider plant is that it is resilient to people with poor gardening skills (like me) and it can be easily grown indoors. In fact, I have one on my bookshelf right next to me! This palm is a plant you are likely to see in someone’s front or backyard. Like the Spider Plant, it is excellent at filtering out formaldehyde, benzene, and xylene. This one is definitely one of my personal favorites as I find it to be absolutely stunning to look at. 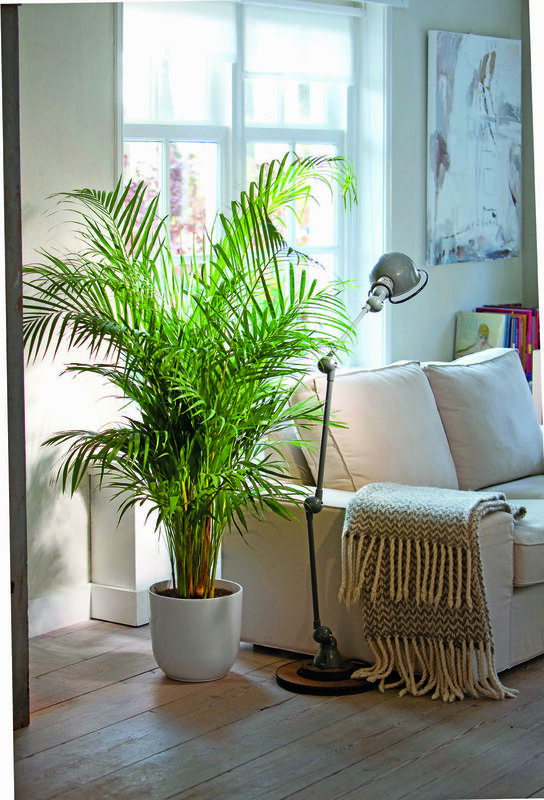 What makes this plant even more appealing is that it is suitable for growing indoors! The Boston Fern filters out formaldehyde, benzene, and xylene. The Areca Palm is, as you guessed, a species of palm tree. It is characterized by its green leaves and yellow stems. It has actually been given the name “Golden Cane” because of its stem. Personally, I am such a huge believer in orchids. They are one of the few flowering plants that actually don’t harm your cats if ingested. I can leave my home confident my fur baby is safe even if she decides to chomp on my beautiful flower. Haha! Yes! You read that correctly!The banana plant is useful at cleaning formaldehyde from your air. As a bonus, you get to eat the king of all fruits! This plant is just so classy looking and can be placed either inside to vamp up a lifeless room or outside on your front porch to welcome guests. A garden just does not seem complete without some beautiful flowers to add a pop of color to the scenery. If you are one of those people who are absolutely terrible with caring for plants, this is definitely one of the easier plants to maintain. Out of all my plants that I have attempted to care for, this one has lasted the longest. I love the clean look of this palm. Be warned though, palms can easily become invested with pests so make sure to keep an eye out! Isn’t this flower just too precious looking? I think this orchid would add that wow factor to really any room you put it in! Found in: Facial tissues, paper towels, plywood paneling, paper bags, waxed papers, and synthetic fabrics. Symptoms when exposed to it: Mouth, throat, and nose irritation as well as swelling of the lungs and larynx in extreme cases. Found in: Resins, detergents, drugs, lubricants, plastics, glue, tobacco smoke, and furniture wax. Symptoms when exposed to it: Drowsiness, irritation to eyes, dizziness, headache, speeding heart rate, confusion, headaches, and in rarer cases unconsciousness. Found in: Leather, tobacco smoke, vehicle exhaust, and rubber. Symptoms when exposed to it: Irritation to mouth and throat, heart issues, confusion, headaches, dizziness, coma, liver damage, and kidney damage. Be careful to remember to ALWAYS double check the scientific name of the plant to make sure what you are really getting is what you wanted. Our little kitties are just so near and dear to our hearts that we have to make sure they are safe even when they feel like taking a tiny nibble from our plants (because we know this is what they love to do!). So take care and enjoy your fresh air! Let me know in the comments your favorite air purifying plant that filters your air! This was very helpful and inspires me to have plants in my home. I’m so glad it helps! : ) I love having plants in my home. I may not be the best at taking care of them but whenever I get a spider plant, whatever smells are in my home disappear within two days! It is amazing! This was very helpful because I have been very cautious everytime I go to lowe hardware to buy my plants and I am so impressed with how pretty some are and then I google it and find out that is harmful to cats. So thank you very much for your information. I am so glad my post was helpful to you! I had the same situation where I would be at the store looking at all of these STUNNING plants just to be disappointed when I look up the plant on my phone. Almost always, I would learn that my cat could become very ill from the plant (especially flowers). I hope you are able to find what you need and enjoy it! Take care! Thank you.. I never even thought about plants being dangerous to cats. Until.I saw my kittens eating a plant like it was a delicious snack.. I looked it up and it was OK. But about every other plant I love was not… Our former cat and dog were never interested in plants. Great article.. I am the same way, Robin! I used to just buy whatever plants I wanted but when I saw my kitty wanting to chomp on them I got really concerned. It’s a shame. So many beautiful plants aren’t pet friendly after all! Loved this post! Thanks! Are all of these plants 100% cat safe? Do you know if they are all dog safe as well? Thanks again for the post! Yes, the plants on the list are safe for your doggies as well. : ) Be sure to do a double check before buying and make sure you’re using the scientific name.